Carson 3D ED vs Monarch 5 ED. Is the 3D ED's "best buy" reign ending? Carson 3D ED vs Monarch 5 ED. Is the 3D ED's "best buy" status ending? For perhaps two years, as this article is being written, the Carson 3D ED binocular has wowed us with its excellent resolution of details, color, brightness, and contrast, that it has held the Best Binocular status at its price point. It's certainly true that we happened to learn about it quite by accident and very nearly didn't buy one to review, since this model is on of the Carson company's first binoculars to really compete on the basis of optical quality. Once we'd had it in the field, though, we realized that our modest gamble had paid off and how fortunate we were to be able to introduce it to our readers. Since buying our first Carson 3D ED in a 10X42 configuration, we bought another in the 8X42 configuration for comparisons such as this one. 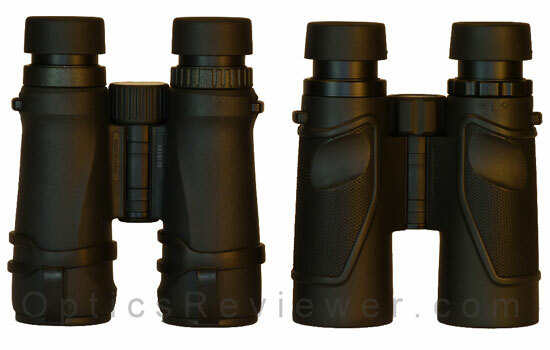 While it's often possible to compare the performance of two optical devices through mathematical computations and arrive at reasonably solid comparisons, we wanted to be able to make direct comparisons with other binoculars in the 8X42 configuration. That way we'd have solid comparative information to base a review on if we had two binoculars of differing magnification, for instance, for which the mathematical calculations suggested they were very close in their performance. Now that you know how we were approaching this comparison, let's take care of one last bit of formal business before we see what the field and indoor tests revealed. Just as we would tell our immediate family members, please don't base a decision only on this article written to compare the Carson 3D ED vs Monarch 5 ED. Here we'll focus only on those items which we believe are significant to such a comparison. By using this approach, we've intentionally omitted a number of things we believe are likely to be quite significant to anyone considering one or the other binocular, but which we've already covered in detail in the individual reviews for these two binoculars. Before you give serious consideration to either of these two binoculars, we urge you to read both of their individual reviews. When holding the binoculars and first visually comparing them, it seemed as though the Carson was a bit smaller, slightly more compact. Interestingly, however, the specifications indicate that the Carson 3D ED 8X42 weighs 23.0oz (652g) and the Monarch 5 ED weighs 20.8oz (590g). We wouldn't have picked up on that 2.2oz (62g) difference if it hadn't been something we made a point of checking. The 10X42 configurations have a 2.0oz (58g) difference. Is it likely to make a significant difference in the larger picture of the comparison? We're guessing that it won't be a significant item for most people. While the 8X42 configurations are identical in their eye relief, the Monarch 5's 10X42 configuration provides a distance of 18.4mm as compared to the Carson 3D ED's 16.0mm distance. If you think this may be a significant factor for you circumstances, it would pay to determine how much eye relief you actually require to be able to comfortably take full advantage of the binocular's optics. The 16.0mm of eye relief should be adequate for the majority of eyeglass wearers, however. The Carson 3D ED vs Monarch 5 ED comparison has a significant consideration in the focusing mechanism. The Carson entry goes from close focus to infinity in 1.25 revolutions of the focus wheel, while the Nikon entry takes the more leisurely 1.5 revolutions to accomplish the same goal. What's so significant about that, you ask? If you're out for a full day's excursion for bird watching or if you're a hunter scrutinizing the terrain for game at varying distances, the more turns your focus wheel requires to adjust for the changing distances of views, the more your fingers will be worn out at the end of the day. The Carson's faster focus will make you happy over the long-term if you use your binoculars much. There's not much more to compare in the physical construction of these two binoculars that's significant. Both have a good fit and finish. Both appear to benefit from a good quality control process. While we tend to focus on differences between binoculars in any comparison, if there is a significant similarity — we'll bring it to your attention. This is an essential comparison area from our perspective. A good binocular will provide a view similar to looking outdoors through a "picture window." A less satisfactory view can be likened to looking through the cardboard tubes that paper towels are wound on. The fields of view specified by the manufacturers don't vary enough to be noticeable at 1,000 yards/meters — the difference is a mere 12ft or 3.7m. It's probably not enough to notice when you're looking at something a thousand yards or meters from your position. If we stop there in comparing the two binoculars, however, we'll miss the critical element in comparing the Carson 3D ED vs Monarch 5 ED. When we consider how much of that field of view is actually useful to us as a potential user, a different element is brought out. The sweet spots of the Nikon Monarch 5 vs Carson views differ significantly. You'll find the details in their individual reviews because we're focused on their comparison here. When we compared the area of the field of view for which details were very well resolved to the point where we could just begin to perceive a softening of those details, we found that the Carson 3D ED 8X42 had a very useable field of view that was larger than the Monarch 5's comparable view by 77.6ft (23.7m). That distance is much more significant than the simple 12ft (3.7m) difference in the total field of view. When we considered the additional field of view between the point at which we perceived a slight blurring and the point at which we noted that the images were noticeably fuzzy, we add a little over 4ft (1.2m) for a total useful field of view 81.8ft (24.9m) greater for the Carson 3D ED than for the Monarch 5 ED. The significantly larger useful field of view is an important factor in the Nikon Monarch 5 comparison with the Carson binocular. This is one of those things that is actually a similarity rather than a difference, but you'll potentially benefit by knowing about it. When Nikon upgraded the Monarch 5 model to include extra-low dispersion (ED) glass for its objective lenses, the concept was to improve the Monarch 5's resolution of details and it's rendering of colors. While using ED glass will certainly improve a binocular's performance in these areas, it may not improve it enough to take a binocular that performed well for its previously lower price to a sufficiently higher performance level to justify its new, higher price. One of the things Nikon did to enhance the Monarch 5's performance and justify the increase in price was to improve its glass coatings. Whether this meant all the coatings, including anti-reflective coatings, or only increasing the number of reflective dielectric prism coatings, we don't know. We do know, however, what resulted from this change. The brightness of the images viewed through the Monarch 5 previously were good, but not outstanding. The brightness of the images viewed through the Carson 3D ED were outstanding. With the upgrades Nikon bestowed on the Monarch 5 binocular, the difference of brightness in the Carson 3D ED vs Monarch 5 ED is small enough, at least in the units we tested, that we were unable to discern a significant difference. Here is another difference between the two binoculars, although it seems unlikely that it will be a difference that make or break a deal for most people, given the other differences that exist. The Carson 3D ED's close focus distance is 9.8ft (3.0m) while the Monarch 5 ED's close focus distance is 8.2ft (2.5m). We would prefer a somewhat shorter close focus distance for both of them, however, as we note in the individual reviews, the distances specified by their respective companies are typically conservative. That is to say, the specifications typically show longer distances than what we found in testing the binoculars we had bought for the reviews. The carrying case for the Carson 3D ED attaches quickly and neatly to the binocular with a wide elastic band and comfortably strong permanent magnets that easily match up when they get close to each other. Given this feature, there is no real need for the Carson to be outfitted with either a rain guard for the ocular lenses or lens covers for the objective lenses. The Monarch 5 has a plastic rain guard for the ocular lenses and some of the better lens covers for the objective lenses that we've found on binoculars we've used. We could, frankly, be happy using either of these approaches to keeping our binoculars' lenses tidy while using them out in the field. While both of these binoculars are good on their own and will enhance the enjoyment of any excursion, we found ourselves favoring the Carson 3D ED. We felt that the Carson 3D ED's significantly larger useable field of view was a critical element in comparing the binoculars and the addition of the Carson's faster focus mechanism solidified the choice in favor of the Carson for what might otherwise be relatively comparable binoculars. 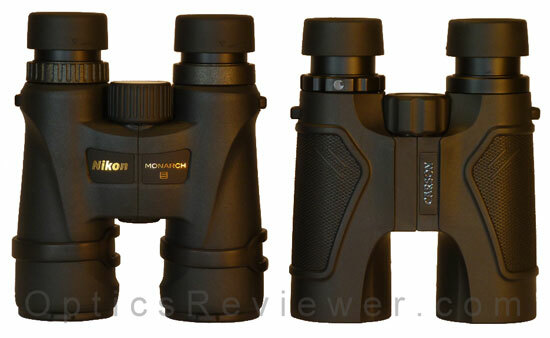 These links take you directly to the selection of Carson 3D ED binoculars in their available configurations on Amazon.com and Amazon.co.uk . These links take you directly to the selection of Nikon Monarch 5 ED binoculars in their available configurations on Amazon.com and Amazon.co.uk . The individual reviews discuss each of these binoculars in much greater depth than this comparison. We recommend reading each of them (the Carson 3D ED review and the Nikon Monarch 5 review) carefully before drawing a conclusion as to which instrument might better serve your interests.